Tuesday, 1 January 2019, 1:31p.m. 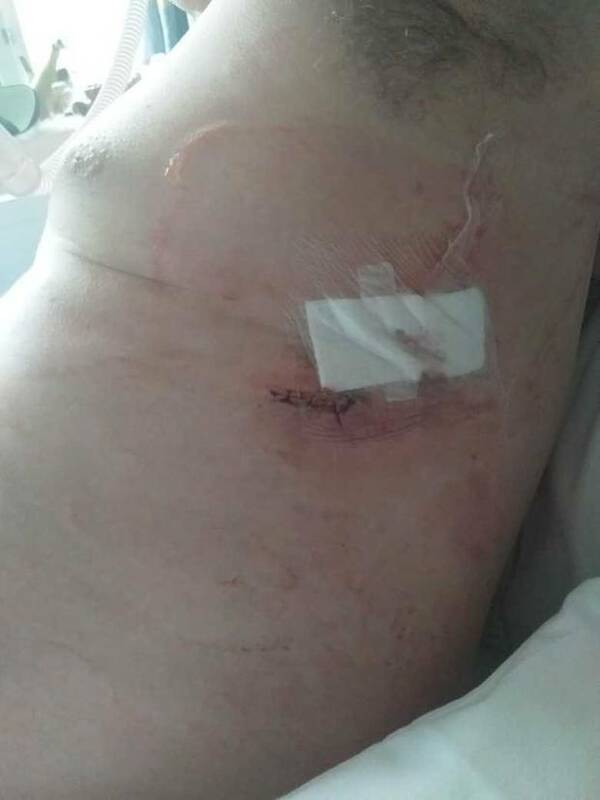 A father attacked by a stingray while boogie-boarding with his two sons has survived with a "good pub story ... and good scar to prove it". Jamie Cunningham, 48, had been enjoying a balmy summer day splashing with his family on Saturday at Invercargill's Oreti Beach, made famous by legendary New Zealand motorbike speed racer Burt Munro. But as he walked ashore with boogie-board tucked under his arm, planning to swap over with his wife Christine who was standing on the beach, the former Glaswegian stood on a large stingray. 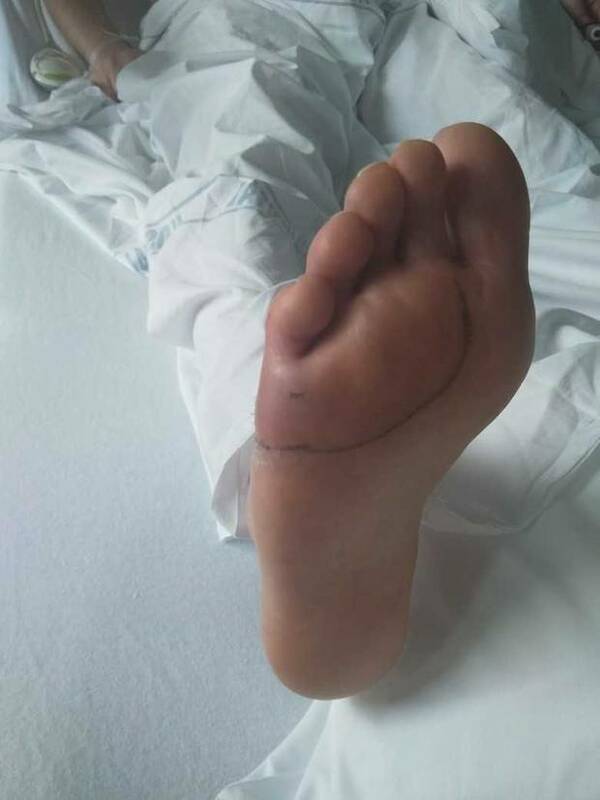 He was near the shore - in about 30cm of water - when he felt an "excruciating pain" in his right foot. Jamie Cunningham got a stingray barb to his chest at Oreti Beach on Saturday. "It was that reaction when you stand on a piece of Lego and your leg just gives way. Next thing I knew this thing has hit me like a steel bar in the ribs under my left arm and I've just gone down," said Cunningham from his Southland Hospital bed today. "I just saw it out of the corner of my eye, it was like a whip. "I didn't even know there were stingrays at Oreti Beach but I knew that whatever it was, it was fairly big and that I had my right foot on it." Cunningham managed to crawl out of the surf, pleading for help. Christine asked why he was holding his ribs and when he took his hand away, she could see an open wound that she described as "raw meat". Knowing his teenage sons - Alex, 14, and Matthew, 13, - were still in the water, he asked Christine to get them back in. Two passersby who happened to be holidaying paramedics stopped to stem the blood flow and call ambulance control. The stingray's toxins soon began giving him serious breathing difficulties and it was feared that the barbs had punctured a lung. His left foot was now purple and swelling. "I was conscious the whole time – I wished I wasn't, the pain was excruciating," Cunningham said. The first Cunningham knew of the stingray was when he felt an excruciating pain in his right foot. An ambulance took him to Southland Hospital where a tube was inserted to drain fluids from inside him. He's been under heavy medication and assisted breathing for the past few days but hopes to be discharged today. "People keep saying I was lucky, but if I was lucky I wouldn't have stood on the friggin' thing," the jovial Scots ex-pat says. "It was a bit freaky, it doesn't happen often does it? Steve Irwin came to mind, although that was a different situation altogether. He was swimming with it, and it misconstrued him as a threat and went for him. And of course he got it in the heart, so regardless if there was venom or not, he was a goner. "But it's a good pub story isn't it, and I'll have a good scar to prove it."